I had an old friend, who wanted everything to go her way. So last month it was her birthday, and she kept talking about wanting a purple care bear ….. So we thought it would be best to buy one straight away. Me and my bestie went to Toys R Us. Umm .. so basically there were care bears but they just did not have a purple one…. So we bought the lightest colour and some purple paint it purple. So our other sort friend came and gave the demanding girl a red bear, and guess what she said? “IT’S SOOOO PERFECT LIKE OH MY DAYS, YOUR THE BESTEST BFF EVER! !” We were so annoyed. Here is how it happened! I was walking to school like normal when I came across a strange road I had never seen before. I was stupid and mindless that I did not look before I crossed the road so I got ran over!!!!!!!!!!!!!!!!!!!!!!!! I was apparently rushed to hospital and luckily survived with only a broken leg. On the 5th of May there was a great performance live on tv. Were you able to see it? It was on at 5 o clock on itv . It was performed by a girl called Mollie . She was very talented . On the 8th of May there was an even better performance by a dance group . Were you able to see it? They were brilliant , excellent , outstanding . The best dance I have ever seen n my whole entire life! The performance by the choir was brilliant on the 10th of May. Were you able to see it ? The best choir group ever! The weird light bulb . One day in a gloomy abandoned cabin the Woods family walked through the door to see if their was any shelter they can use . So they knocked on the door but no one answered so they walked in . Nobody was their so they walked in and sat on a big scruffy sofa in the middle of the large room … They looked and realised it was very dark so they walked to the front door and switched on a switch … Nothing happened … So they switched it on again … A massive light shone from the ceiling … The eldest in their family looked up to see if it was a light bulb … But he got blinded by the bright light … That’s why you never look straight into a light . Today the temple family got into the car and drove to the gym at 8.00 am to do are marathon training. When they got there they forget their water so they drove back.The temple family finally arrived at the gym with all their equipment. But they were exhausted so they just sat at a table in the gym cafe and watched people play tennis in the inside court. At 10.00 am they drove back home … It was now 2.00 pm and the little girl had a party to get so she lazily got in the car . She got there at 2.45 . Because she was exhausted she spilt her drink all over her best friend new computer! In the heart of a weird forest there stands a mysterious tree. The tree is covered in dangling branches and … a … bike! 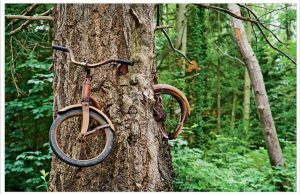 The bike is wedged between the gnarled tree. The bike got there from a biker crashing. The creepy part is no one really knows how the crash happened. Some people believe it was magic. Some people just believe it was a tragic accident … Now no one dares go to the tree because it is to scary.